HomeNokia 1 SpecsNokia 1 the cheapest Android Smartphone, behind the Shaomi Redmi Go, its price, features and specifications. Nokia 1 Cheapest Android Go Phone: By defeating Shaomi Redmi Go, the Nokia 1 Smartphone is now the cheapest Android Go phone. The price of Nokia 1 has come down to Rs 3,999. At the same time, the prices of redmi go is Rs 4,999. These phones have been launched in the market to entice highly affordable and first-time Android users. 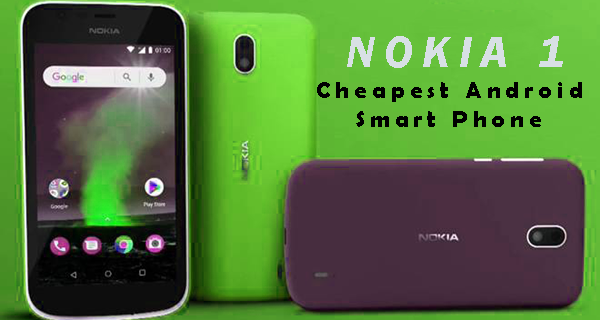 Nokia 1 has now become India's cheapest Android Go Smartphone. Last year, this phone was launched with a price of Rs 5,499. But this week, the prices of Nokia 6.1 Plus (6 GB), Nokia 2.1 and Nokia 1 have been reduced to Rs 3,999. This means that Redmi Go has lost the limelight of being the cheapest android phone from the country. Shyomi launched the Redmi Go phone last month, which cost 4,999 rupees. At that time it was the cheapest Smartphone. But HMD has given a stern answer to Shomai Redmi Go by reducing the price of Nokia 1. It is also expected that the company is ready to launch the Nokia 1 Plus Android Go phone. Android Go Smart phones are the first time Smartphone users have been launched to entice. Their prices are also low and they are extremely reliable. Nokia 1 and RedmiGo are well known Android Go Phones in the market. Nokia 1 has 4.5 inch FWVGA (480 * 854) display. This small size phone has 1 GB RAM and 8 GB internal storage, which can be increased to 128 MB with memory card. This phone runs on the 1.1GHz Quad-Core Media Tech MT673M processor. Talking about the camera, Nokia 1 has a 5 megapixel primary camera and 2 megapixel selfie cameras with LED flash. The Nokia 1 Android Go (Go Edition) phone offers Google Go apps such as Gmail go, YouTube Go, Maps Go and many other features. The phone has 2,150 MAH batteries for power. On the other hand, compared to Radmi Go's Nokia 1, this phone of Shawmi has 5 inches screen, which has 720p HD resolution. This phone runs on the Quad Core Snapdragon 424. It also has 1 GB RAM and 8 GB internal storage, which can be further extended through micro SD card. In the Redmi Go, the battery is 3,000 MAH compared to Nokia 1. Radmi Go also runs on Android Oreo and is also equipped with Google Go App. It also has an 8 megapixel primary camera and 5 megapixel selfie camera with LED flash. Nokia 1 and Radmi Go 4G VOLTE support. It also has 3.5mm jacks.